Atacama Evoque Eco 60-40 review | What Hi-Fi? It isn’t often that hi-fi racks get an appreciative ‘ooh’ out of us at first glance, but Atacama’s new Evoque range wins points on design alone. 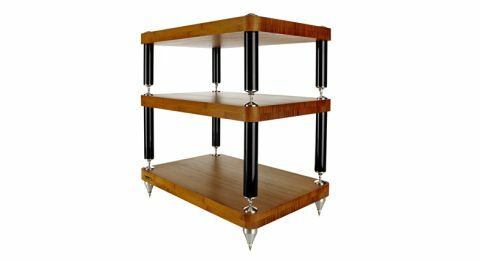 The solid bamboo shelves, the glossy black legs and the shiny steel cone caps and spikes all add up to a rather gorgeous-looking rack that we want in our homes. Build and finish is excellent too. It’s a modular design: you can add extra shelves for £150, and customise the height of each tier with a number of leg-length options. Bamboo naturally darkens with age, but you have the choice of natural, medium and dark finishes for the 40mm thick shelves. The Atacama isn’t just a pretty piece of furniture. With our Cyrus CDi/Roksan Caspian M2 reference system, the sound is confident, insightful and hugely enjoyable. There’s a satisfying rumble to the punchy baselines, a clear and open top end, and voices are presented with nuance. It might not initially sound quite as immediate as some rivals, but longer listening reveals plenty of attack. It’s pricier than its rivals, but we think the Atacama Evoque is well worth it.